2. Mix a little heavy cream into each glass for a more cloudy look. 3. Pour the Yellow Bottom layer slowly into shot glass. 4. Hold a small spoon in the shot glass just above the Yellow Bottom layer and slowly pour Orange Middle layer onto the spoon. 6. Repeat steps 4 & 5 with the White Top layer. 7. Repeat steps 3-6 for each shot glass. 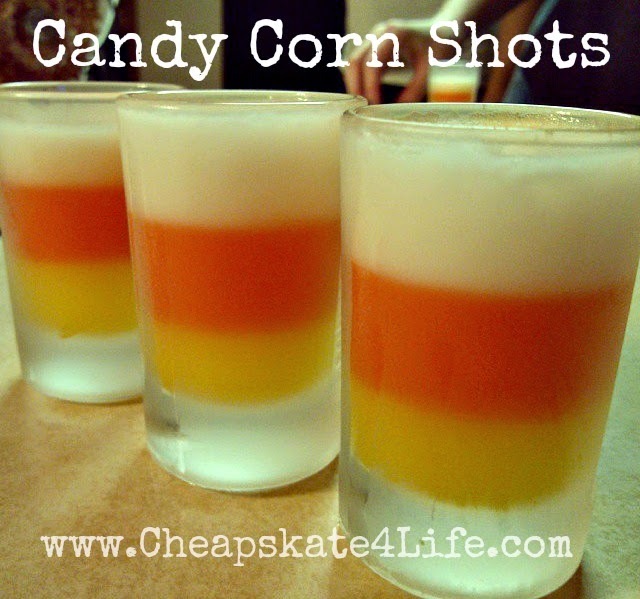 Recipe yields 4 to 5 Candy Corn Shots. Enjoy!